Charles A. Marvin was a good man. He spent his life working on his farm in north central Pennsylvania. He attended church and participated in politics. He and his wife of forty-six years raised eight children. Members of his community respected and liked him. However, for “one year, eleven months, and six days” he left home to fight for his country and preserve the Union. This is the story of Private Charles A. Marvin and the Seventh Pennsylvania Volunteer Cavalry Regiment. Charles A. Marvin was born on April 20, 1829 in Covington, Tioga County, Pennsylvania to Tilley and Camelia Marvin. Charles spent the first twenty-two years of his life working on his father’s farm, performing more complex and strenuous tasks, and learning how to survive as a Pennsylvania farmer. On January 1, 1852, Charles married Miss Olive Walker of Covington. After his marriage, he bought a farm and “followed the occupation of farming.” The couple had eight children. After nearly three years of war, Charles finally enlisted in the Union Army on February 12, 1864. He was nearly thirty-five years old. 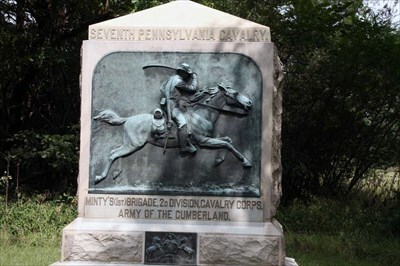 He spent the next eighteen months in the Seventh Pennsylvania Volunteer Cavalry Regiment as they fought under Major General William T. Sherman in the Atlanta Campaign in 1864 and under General James Wilson in his campaign in Georgia and Alabama in 1865.